Each summer six math whizzes selected from nearly a half-million American teens compete against the world’s best problem solvers at the International Mathematical Olympiad. Steve Olson followed the six 2001 contestants from the intense tryouts to the Olympiad’s nail-biting final rounds to discover not only what drives these extraordinary kids but what makes them both unique and typical. In the process he provides fascinating insights into the science of intelligence and learning and, finally, the nature of genius. Brilliant, but defying all the math-nerd stereotypes, these teens want to excel in whatever piques their curiosity, and they are curious about almost everything — music, games, politics, sports, literature. One team member is ardent about both water polo and creative writing. Another plays four musical instruments. For fun and entertainment during breaks, the Olympians invent games of mind-boggling difficulty. Though driven by the glory of winning this ultimate math contest, they are in many ways not so different from other teenagers, finding pure joy in indulging their personal passions. Beyond the the Olympiad, Olson sheds light on many questions, from why Americans feel so queasy about math, to why so few girls compete in the subject, to whether or not talent is innate. Inside the cavernous gym where the competition takes place, Count Down uncovers a fascinating subculture and its engaging, driven inhabitants. • Oaz Nir has already won a gold medal — the highest individual honor awarded — at the preceding International Mathematical Olympiad. But his life is not all about math. In high school, he’s also competed athletically and has spent time writing poetry and short stories. Oaz is currently in his junior year at Duke. • Gabriel Carroll, another previous gold medalist, has always attended the public schools of Oakland, California. He’s a master at mirror writing: offer him a sentence, and he can immediately write it backward. Gabe is in his junior year at Harvard. • Tiankai Liu has been bewitched by mathematical concepts since he was eighteen months old. His mother recalls that she took him for walks at that age and that his breath got short when he saw manhole covers of different sizes and shapes. Tiankai is in his senior year at Phillips Exeter. • Ian Le, trying to reach the highest rank of U.S. math competitors in the eighth grade, read his father’s college math books, took a class at Princeton University, and became absorbed for hours solving individual problems. Ian is in his junior year at Harvard. • David Shin takes breaks from his training for the math competition by reworking tunes on a piano — to the degree that he exasperates the other teens. David is in his junior year at MIT. • Reid Barton, if he wins another gold medal, will become the first contestant worldwide to win four of them at the Olympiad. Reid is in his junior year at MIT. • Titu Andreescu, the American team coach, a Romanian émigré, currently teaches mathematics at the University of Wisconsin. • Melanie Wood, the 2001 team guide, was the only girl ever to make the U.S. team — she did so in 1998 and 1999. Melanie is currently studying mathematics in Cambridge, England. Q) Were you on the math team when you were in high school? When did you develop an interest in mathematics? 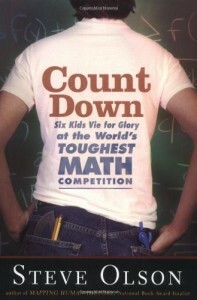 How did you come to see the topic as one that should be explored fully in a book?A) In the small town where I grew up, the idea of students’ participating in a math competition would never have crossed anyone’s mind, and that remains the case in many parts of the United States today. But every small town has kids who like mathematics, and I was one of those kids. I graduated from high school in 1974, which was the first year that the United States participated in the International Mathematical Olympiad, and I followed the U.S. team’s results with growing interest in the years after that. The six high school kids on each year’s team were competing against the best young mathematicians in the world, solving incredibly difficult problems under immense time pressures — yet they were doing extremely well. I knew that I would write about the Olympiad someday.Q) Of the kids, each seems unique — their personal interests vary from piano to soccer — yet all are achieving at a very high level. What quality of character do you see as common to most of them? In what ways do they differ from their classmates who don’t have an interest in math or perform at the same level?A) The members of the U.S. team that I write about in Count Down are very different kids, but they have one thing in common: an amazing mathematical creativity. We tend to think of math competitions as emphasizing rigor and logic, as if the competitors were being asked to perform elaborate calculations. But high-level math competitions emphasize completely different skills. To excel at an Olympiad, you have to think of new and unusual ways to solve problems. The kids on the team are mathematical artists — they come up with solutions that no one has ever imagined before.Q) You reject the idea of genius as being the quality they possess. How do you define “genius” and how do you see it misused in our culture?A) The problem with the word “genius” is that it obscures more than it reveals. The kids on any Olympiad team do remarkable things. But I don’t think we should ascribe their accomplishments to an unknowable genius that we can never hope to understand. When you ask them how they solved a problem, you discover that they used skills that everyone shares, but their skills have been developed to a very high degree. And understanding the origins of their success makes their accomplishments seem even more remarkable. Q) Being so advanced in their understanding of mathematics sets them apart from their peers. Did some of the six have a better way of dealing with this difference than others? Which and how? A) To succeed at this level of competition, you can’t waste time second-guessing your accomplishments. All six kids on the U.S. team had long since come to terms with their status as the country’s best young problem solvers. And the world of competitive mathematics is not nearly so lonely as people might imagine. Half a million kids in the United States each year participate in the initial competitions that culminate in the selection of the U.S. Olympiad team. Q) Mentoring by a parent, teacher, friend, or coach would seem to be an important element in the development of most abilities, but especially an aptitude for math, since the wider culture doesn’t reward it in early life. Which people in your book do you see as the best kind of mentors? A) The best mentors are people who instill a love of mathematics in young people and then provide the freedom and support needed for them to follow that love wherever it leads. No one can force a young mathematician to achieve at these levels. Success requires too much dedication and training. The members of a U.S. Olympiad team all love math. But none of them would have made the team without a mentor who fostered that love. Q) Melanie Wood, who was on the U.S. Olympiad team in 1998 and 1999, remains the only girl to have made the team since we started fielding the teams in 1974. Why do you think more girls don’t participate at these levels? To what degree is it a social issue, and is there any truth to the old shibboleth that boys are hard-wired (physically, genetically) for math and girls are hard-wired for language? A) Melanie says in the book that more girls could do well in competitions but that they are intimidated by the prospect of competing with boys. Also, the paucity of girls at the highest levels of competition is much worse in the United States than in other countries — many teams at the Olympiad each year have female members, but the U.S. team has had only one over the past thirty years. I devote a chapter of the book to exploring possible reasons girls are underrepresented in math. The possibility that boys have a biological advantage is the easy answer, but the closer you look at that explanation, the less compelling it seems. Many cultural factors keep girls away from math. To take a more familiar example, Rolling Stonemagazine recently published a list of history’s top hundred rock guitarists, and only two women made the list, yet no one claims that women are biologically inferior as guitarists. Q) Many of the team members are from immigrant families. Why do you suppose that is? Are, for instance, Asian societies and cultures structured in a way that rewards mathematical ability? A) The more Americanized students become, the less well they do in school — and that applies for all subjects and all immigrant groups, Asian-American or not. I think that that says more about U.S. culture than about kids. American culture often disparages academic achievement, especially in science and math. Every time I see another mad scientist in a movie or a geeky, computer-programming kid on TV, I gnash my teeth in frustration. A large part of our future strength as a nation will depend on the achievements of these kids — we can’t rely forever on new generations of immigrants to replenish the country’s supply of scientists, engineers, and mathematicians. Yet we continually send messages to kids that math and science are only for weirdos. Q) Why is math aptitude not valued in our society? What is it about math education in the United States that seems to be different from other educational systems? How can our math education be improved? A) Math education in this country is for the most part a disaster, though not for the reasons that get the most attention. The “Math Wars” over whether computational fluency or conceptual understanding should be emphasized are completely beside the point; people might as well argue over whether your right leg or your left leg is more important for walking — of course you need both. The question we should ask is why so many Americans view math as onerous and boring. That’s not the case in other countries, where math is often seen as an interesting and enjoyable subject. A large part of the problem is teacher training — either we need to improve the comfort level of existing teachers in math, or we need to get math specialists into classrooms who can do a better job of teaching the subject. Math teachers also can learn a lot from the techniques used to prepare students for math competitions, because the only way to do well in a competition is to understand math at a fundamental level. Q) Some members of past U.S. Olympiad teams have gone on to become mathematicians, but the majority have gone into other fields, from genetics to investment banking. Do kids who spend so much time on math in high school burn out? A) The kids on Olympiad teams are capable in so many ways that they have many options in life, and during college many Olympians are attracted to new challenges. But no matter what they do, they tend to be successful because they apply the same skills they honed as Olympians: they are resourceful, creative, analytical, and determined. Q) Do your children take part in math competitions? How has your experience with these six kids changed how you interact with your kids — not just in terms of math education, but in fostering excellence? A) I have helped coach the math teams at my kids’ schools for many years, and the experience has been one of the great pleasures of parenthood. None of the kids on our teams has ever risen to the top levels of competition, but that’s not the point — you wouldn’t expect ever to coach a Pee-Wee baseball team that produces a Major Leaguer. The point is that the kids and I have had a great time and have learned a lot of math.